Welcome to Real-life Sci-fi worlds. I use science to explore life-bearing worlds that are the settings for science fiction stories. Up today: a desert planet like Arrakis from the classic Dune books (and the movie and miniseries). A tribute for author Frank Herbert‘s birthday (a couple days late). 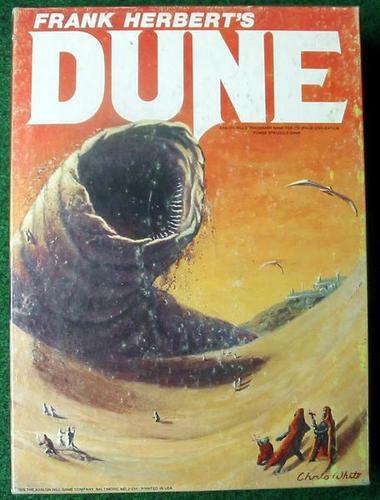 Dune is one of the all-time classic science fiction stories. It is set on Arrakis, a desert-covered planet. Arrakis is the only planet in the Dune Universe with melange (aka “the spice”), a life-extending drug that makes it possible for people to travel between the stars. It is also infested with gigantic super-dangerous sandworms that live underground and are a prodigious source of nightmares. This post will be a little different than the early real-life sci-fi worlds. I’m going to use Arrakis as an example of a desert planet. But we will mix it up. I will discuss the specifics of Arrakis but also some of the more general characteristics of desert planets. Here are the questions I’ll address in this post. What would Arrakis’ orbit be like? Can desert planets like Arrakis be habitable? How do desert planets like Arrakis lose their oceans? How common are real-life desert planets orbiting other stars? And what is likely in store for Arrakis in the future? It is the third planet orbiting the star Canopus, the second brightest star in the sky. It has two moons. It is mostly covered in sand dunes (hence the name) with some rocky outcrops. There is no surface water but there are some canals used for irrigation (called qanats). Some people (the Fremen) collect water in underground reservoirs with the long-term goal of terraforming Arrakis. There is abundant water in the planet’s interior. Salt flats indicate that Arrakis used to have lakes and oceans. The atmosphere is primarily of nitrogen and oxygen in amounts similar to Earth. The source of oxygen is sandworm metabolism instead of oxygenic photosynthesis. There is some native vegetation similar to that found in deserts on Earth. There are some grasses, cactii and bushes, as well as a few small animals. A more general desert planet is simply one that doesn’t have much surface water. It can have some ponds or lakes but no oceans. Its surface is dominated by land. Its atmosphere is dry — there isn’t enough water to provide much humidity on a global scale. Arrakis’ orbit must be pretty wide. It could reasonably be hotter than Earth and on a closer orbit. But it can’t be so close as to preclude habitability. If we assume that Arrakis receives the same of energy from the star as Venus (which is pushing it a little), its orbital distance would be about 88 times larger than Earth’s around the Sun (it would be 88 “Astronomical Units”, or AU). Arrakis would take 263 years to orbit Canopus. That is about how long it takes Pluto to orbit the Sun. I couldn’t find information on Arrakis’ orbital distance or eccentricity, its obliquity or spin rate. Given that seasons are not mentioned, Arrakis’ orbit must be pretty circular and its equator is probably close to aligned with its orbit (in other words, it must have a low obliquity and eccentricity). Can desert planets like Arrakis really be habitable? It turns out that desert planets like Arrakis might even be more habitable than planets like Earth. What I mean is, the habitable zones of desert planets may be wider than for planets with oceans. This was described in a very cool paper in 2011 (paper here, space.com article here). Desert planets with little surface water can be habitable closer to their stars than “ocean-dominated planets” like Earth with lots of water. The hottest places on desert planets cool off more efficiently than on Earth-like planets because the humidity is lower; radiation from hot places is a key way that planets (and giraffes) keep cool. The low humidity in the atmospheres of desert planets also reduces the greenhouse heating from water vapor. Finally, planets tend to lose their water by hydrogen escape from the upper atmosphere. Since desert planets’ atmospheres are so dry they lose far less water than Earth-like planets. Arrakis from the video game Dune 2000. Copyright Westwood Studies/Electronic Arts. Desert planets are also better than Earth-like planets at avoid freezing over. When a planet gets cold, water turns to ice. Ice is very reflective, so the planet absorbs less energy from the star. This makes it colder, which makes more water turn to ice. And so on. This is called ice-albedo feedback (this was important for the oscillating Earth). Since they have less water, there is a much less ice on a desert planet’s surface when it gets cold. This effectively stops the ice-albedo feedback from getting carried away. To summarize: compared with a planet like Earth, a desert planet like Arrakis can remain habitable both closer-in and farther-out from its star. What is surprising is that it is water itself that reduces the habitability — the ability of a planet to have liquid water — of Earth-like or ocean-covered planets. Of course, this is a hot topic so there is plenty of debate (see here for a recent perspective). How do desert planets like Arrakis lose their oceans? In the Dune universe Arrakis started off as a planet with oceans. It was biology itself that dried up Arrakis and turned it into a desert planet. The entire surface water budget of the planet was basically gulped up by sandtrout, the leathery precursors to sandworms. The sandtrout … was introduced here from some other place. This was a wet planet then. They proliferated beyond the capability of existing ecosystems to deal with them. Sandtrout encysted the available free water, made this a desert planet … — from the book Children of Dune. Arrakis’ water hasn’t left the planet, it’s just stuck inside of sandtrout, buried in the sand! This is a case of a very destructive invasive species! (Like the snakes that were brought to Guam that killed off most native bird species). In a more general context, where do desert planets come from? Maybe they just form without much water. That can indeed happen. Planets get their water by collisions of objects that condensed in the colder outer reaches of the system. Planets that form closer to the star can sometimes just not get any water. The trick is that to be potentially habitable, desert planets still need some water. They can’t be bone-dry or there would be no liquid water — the requisite for habitability — anyway! But can Earth-like planets or even ocean-covered planets turn into desert planets? Well, it depends how efficiently they lose their water. Water loss is a complicated process that requires a wet upper atmosphere and a lot of very energetic light from the star (X-rays and ultraviolet). In simple terms, the planets that can lose their water are relatively close to hot stars. It’s very tricky to calculate exactly but the punchline is: YES, many planets probably can and do lose their water. These planets start off as ocean-dominated planets and can transition to being desert planets with wider habitable zones rather than just losing all their water too fast. So in some situations — like very close to the star — an ocean planet must lose its water and become a desert planet in order to become habitable. It’s easier to make a desert planet out of a rocky planet with some water (a super-Earth) than a gaseous planet (a mini-Neptune). It turns out that both kinds of planets are very common. But only small planets are rocky. Planets smaller than about one and a half to two times as big as Earth. 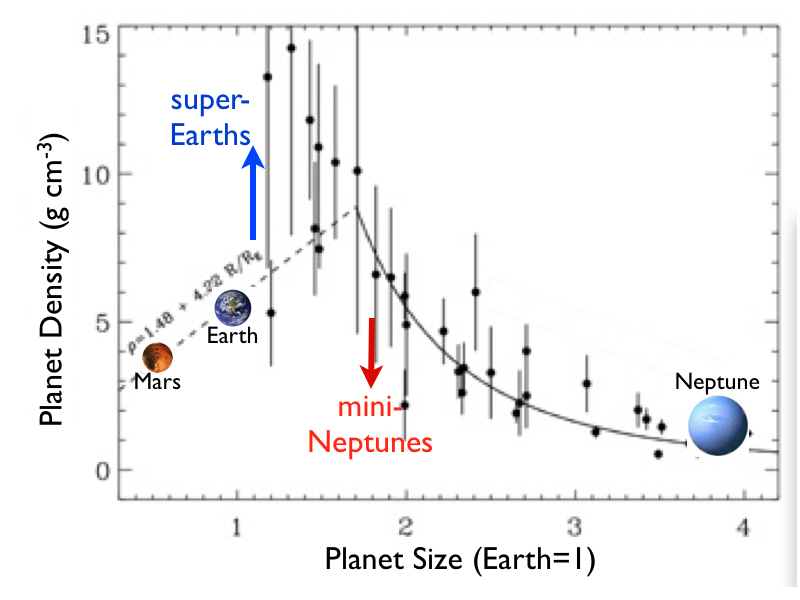 Bulk densities (y axis) of small extra-solar planets of different sizes (x axis). Mars, Earth and Neptune are included for scale. Credit: Lauren Weiss and Geoff Marcy (see this paper). Discussed in detail here. Small planets are typically rocky whereas larger ones are gas-dominated. The small ones are the best candidates for being or becoming desert planets. I could not find any information on Arrakis’ size or mass but it would make sense for it to be similar to Earth. How common are habitable desert worlds like Arrakis? Planets exactly like Arrakis must be very rare because stars like Canopus — yellow supergiants — are very rare. Only the most massive stars ever become supergiant stars. And the yellow supergiant phase itself is just a few thousand year-long stepping stone toward the longer-lasting red supergiant phase. In time, Canopus will go supernova (see below)! In short, since only a few hundred yellow supergiants are known, the odds of finding a true Arrakis analog are slim to none. Plus, since Arrakis takes so long (200+ years) to orbit Canopus and supergiant stars tend to be very far from the Sun, it would be extra-tricky to find a planet orbiting one. But generic desert planets should be extremely common. Their habitable zones are wide so there is a lot of real estate in which to find them. The only requirement is for the planets to be less than about 1.5 times Earth’s size. At least about 20% of all stars have planets of that size, and at least 10% of stars probably have planets of that size in a broadly-defined habitable zone. There are almost certainly Earth-sized planets in the habitable zone in our immediate Galactic neighborhood. But what fraction of these planets is a desert planet? We don’t have any concrete way of knowing. In the Solar System there are 2 planets in a broadly-defined habitable zone: one ocean-dominated planet (Earth) and one desert planet (Mars). It has also been speculated that Venus was a habitable desert planet as recently as 1 billion years ago. Optimistic estimate: Let’s assume that half of all small planets are desert planets. There is likely a desert planet around one of the, say, 20 closest stars to the Sun. Pessimistic estimate: Let’s say that ocean-dominated planets are much more common than desert planets. Only 1 in 100 small planets is a desert planet. We must sample the closest several hundred to 1000 stars to find one. A good place to look may be in a star’s “Venus zone“. 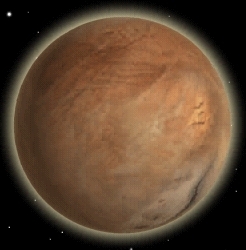 The closest desert planet must still be located within about 50 light years. Within a hundred thousand years or so, Canopus will expand further to become a red supergiant (like Betelgeuse). 10-100 million years after that it willl go supernova then collapse into a neutron star or a black hole. What will happen to Arrakis when Canopus goes supernova? Best-case scenario: it is flung into interstellar space and survives as a free-floating planet. Arrakis will lose its source of heat but will be well-served by its underground habitats. Worst-case scenario: it is completely vaporized by the ridiculously intense emissions from the supernova. Not a happy ending! There you have it: Arrakis from Dune as a real-life sci-fi world. I am of course no Dune expert, so if I missed anything please let me know in the comments. I also only skimmed the surface of some of these issues, so feel free to ask questions in the comments. I think it is amazing that you could construct a situation where Arrakis is possible. Could Frank Herbert have known a lot of these things back when he wrote Dune or did he just throw together some cool sounding ideas with no idea as to their plausibility? What was the state of planetary astronomy (or whatever its real name is ) back then? Good point Brent. The original book came out in 1965. Canopus’ actual brightness was not known until the 90s (because the distance to Canopus wasn’t known). Most of the details of how stars evolve were figured out in the second half of the twentieth century, so where Canopus came from and how it should evolve were certainly harder to know while Frank Herbert was writing Dune. Plus, the issues related to the climate have only really been studied in detail the last few years. As a setting, Arrakis is awfully plausible. Nice job by Herbert. And the sandworms are just awesome! 6) what’s going to generate the breathable oxygen? Frank Herbert in DUNE wrote:Dawn’s gray line behind them was brightest at the notch in their horizon-calendar that marked the middle of autumn, the month of Caprock. Dune appears to have seasons, and enough axial tilt for solar calendars to be meaningful. Later, near the Shield Wall, Jessica and Paul sleep during the day (presumably hours) to wait for nightfall. He had awakened shortly before nightfall, sitting up in the sealed and darkened stilltent. Approximate per DUNE map, but Arrakis appears to have fairly normal day/night cycles for 65’N, no mentions of polar nights in the books. Challenge: reconcile solar calendar measured seasons on Arrakis with a solar year on the order of 100-200 years. Here’s an example of a fictional world that is habitable but with much less water than Earth. These descriptions are largely reconcilable with science if Arrakis is a terraformed world. Canopus is a relatively short-lived star (as in “lives less than a thousand million years”). This would make Arrakis far too young to have macroscopic life, maybe too young to even have life due to an unstable environment. Since Canopus lives such a short, hectic life the terraformers might have tried to speed up their process. The life form called “sandtrout” would then have been introduced and genetically engineered to enormous size for this purpose. If so, it would have worked too well: the resulting “sandworms” gulped up most of Arrakis’ already scarce water. These events would then have been misunderstood as taking place naturally over geological ages. Something people might be unaware of Arrakis not having time for. The mention of forest indicates that Arrakis has at least one considerable body of water. It does not have to be an ocean: a large, brackish lake would do. (Think Lake Aral or Lake Chad before them both started shrinking.) Suppose that the “sandworms” can’t cope with the climate near the poles. Then there could be one or several such lakes in Arrakis’ polar regions. Maybe in early terraforming there were such lakes scattered all over the surface like in the Tharn example. If so, the salt flats would be analogous to the Aralkum Desert which now covers most of what was once Lake Aral.